With so much talent in collegiate a cappella, we thought we'd do our part and bring it directly to you. Tomorrow night, we will be kicking off our very first "Aca-Live" session via Facebook Live. We've invited a few talented groups to deliver an up close and personal performance for all of the aca-fans out there throughout the month of February. You'll get to learn a little more about some of your favorite groups, ask them questions, and hear some of the incredible arrangements they have been working on. Each week we'll be featuring a new group, and we've got a great one to get things started. Be sure to visit our Facebook Pagetomorrow night to catch the all-male group The Midnight Ramblers. The stream will go live around 9:30 PM/ET. In the meantime, check out the below interview we did with the group to hold you over till then. Can you tell me about the group's founding? When did the group begin? Any specific influences, past or present that you all can point to that inspire(d) your style? The Midnight Ramblers were founded in 1998 by Jon Huang, who is now a triple board certified transplant hepatologist at Strong Memorial Hospital. A cappella at that time was more inspired by barbershop, doo wop, and the like, and the founding Ramblers really wanted to expand into pop music. We were founded under the pillars of performance and innovation. We try to always bring as much energy as possible, regardless of the size of our audience. In terms of innovation, that could mean a couple of different things. We were one of the first groups nationally to use individual microphones for our semester shows. In our arrangements, we always deviate far from the "four chord songs" you hear on the radio. One of our arrangements last year was "Hello" by Adele, except we styled it in swing format, in 6/8 as opposed to 4/4, and made it pretty jazzy. That arrangement worked very well when we went to ICCA last year, but that's not always the case. Sometimes people expect to hear a song how the original artist arranged it, and that's totally okay! Learning processes like that are what really propel our group forward. 2. What would you say is the group's current focus, if any, when it comes to the songs you all perform today? Any particular style? We only do arrangements that we're passionate about as a group. That tends to be more along pop, top 40 some of the time, but we've done classic rock, jazz, country, and variations or mashups from Michael Jackson, the Beatles, etc. We've found that we perform at our best when we do songs out of an intrinsic motivation - it's not fun doing songs just because you feel you must. We have a new guy this semester who is very gifted in rap and freestyle, and we're looking forward to exploring some uncharted territory for us! 3. 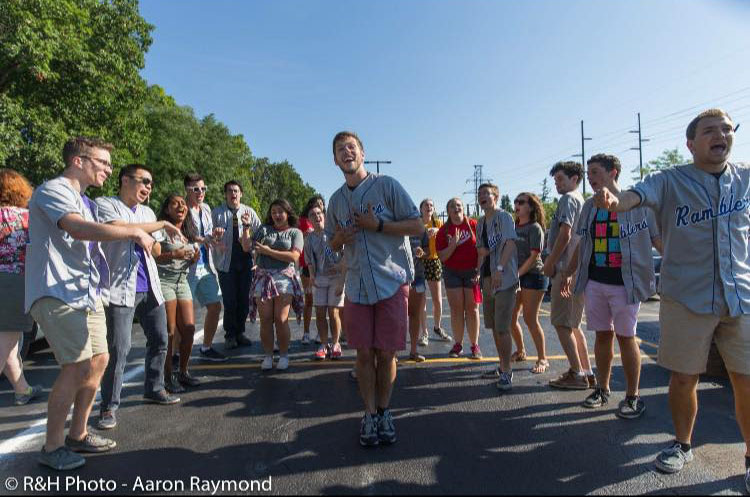 The Ramblers currently share the University of Rochester campus with various other a cappella groups. How does the group differentiate itself from these other groups? What makes the group so special? We have five recognized groups on campus. Two of which are co-ed, one female, and two all-male groups (us and the YellowJackets). We're a tight-knit community on campus, and we always support each other. When we competed in ICCA, other members came to cheer us on, and we're going to be doing the same for them this year. At our founding, the Midnight Ramblers did much more pop than the YellowJackets, but that had gradually merged over time. The two biggest things that differentiate us are our members, I'd say. Keegan, our primary vocal percussionist, is ridiculous. He can do dub step, jazz, crazy trumpet sounds, and any rhythm that you can throw at him. Ben Hall, our musical director, does the bulk of our arrangements. He has a conceptual understanding of music theory that just blows my mind, and he's a double major in math and physics! We're just so fortunate to have guys that are excited about the learning process with a cappella, and it's an honor to work with them. 4. What current projects are you currently working on? Any new albums, videos, tours, philanthropy, etc.? Last year, we released our tenth full-length album, Déjà Blue. We also placed second in our ICCA Semi-finals, with awards in best vocal percussion and best arrangement. It was a BIG year, and we're trying to focus more on performances and opportunities in our local community. ICCA was a great growing experience and really challenged us to take push our group to the next level, but at the end of the day we're still a bunch of guys who like to sing and share our passion with others. Our eleventh album is already in the works, and we're going to be on tour during our spring break – location, which is TBD. We travel every spring, but our location usually depends on where the University of Rochester has alumni celebrations or prospective students. We are, at our core, a group for the University. 5. This past year you all took part in the project “It's On Us” that brought attention to the crisis of sexual assault. What inspired this decision and what was it like shooting the video for "Til It Happens To You?" Working with MOVE (Men Opposing Violence Everywhere) - a male activist group at the University of Rochester - was extremely rewarding. Jake Gusman, a recent alumnus, was a member of MOVE and wanted to take action. He came to the rest of the group, had an idea, and we went with it. Sexual assault is REAL in the college setting. Change doesn't happen without awareness, and that was all we tried to do. We wanted to get conversations started, give resources to people who were a victim of sexual assault, and I hope we made a difference through our efforts. 6. What are some things The Ramblers like to do outside of music that contributes to your musicality? A fair number of us have music minors, and are interested in music theory or history. I think all of us either play piano, drums, guitar, or some other instrument. 7.What do you think about the current state of a cappella? Do you feel groups like yours get enough attention? Do you ever struggle in getting attendance to performances? Too much competition in the collegiate space? I think Pentatonix brought a cappella out of a niche and more into pop culture, which has sparked some great innovation. Beatboxing is more popular now, and people are constantly pushing the envelope. We're not really out for any grandiose recognition, really. We make our albums, share things that we're proud of with other groups, and they do the same with us. College groups from around the country have given us material to make us the best we can be! We're pretty established at the U of R, and tend to fill up our auditorium fairly well. It's tough, though. Sometimes it takes convincing to get people to come to any performance nowadays - why would they leave their room if they have high quality headphones, a computer, and YouTube right in front of them? All of the performance groups at our school have been taking some hits in attendance, but I think that should just inspire us to be more innovative as we venture to a new era in a cappella. 8. Could you give us some background on this photo from your Instagram account? What was the event for, how'd you get involved, and what was memorable about it? That Instagram picture was just a gig we did for the American Heart Association. A local rep reached out to us to sing for patrons for the event as they ate. We do a lot of performances in the local Rochester community similar to this, and the paid ones are how we've been able to fund 10 full length studio albums since we were founded in 1998. 11. As a group who just accepted new members, what is it like trying to convince new talent to join the Ramblers versus another campus group? Anyone who joins the ramblers is meant to be here. We have auditions every semester, and the turnout is always fantastic. So many people come in with a wide variety of experiences, but there's always talent out there. We took in three freshmen last semester and a junior (transfer student) this spring. We advertise our auditions online, make posters, and the like, but people are often intrinsically motivated to be a part of a cappella. That's what I love. They show up because they're passionate about music, and that's what immediately shines through for me. 11. Anything else you'd like for our audience to know about the group? You can check out the Ramblers representing the University of Rochester in music videos released by the Office of Undergraduate Admissions (search: Remember oUR Name), "'Till it happens to you" in collaboration with Men Opposing Violence Everywhere (MOVE), which was to raise awareness of sexual assault in the college setting, or on iTunes with our latest studio album, Deja Blue. For more information, take a look at our Facebook Page or learn more at midnightramblers.org!